I spent the Thanksgiving holiday on an island 25 miles out in the Atlantic, accessible only by ferry and small plane. I had some alone time, which I crave, but not enough. However, I also had a wonderful week with family and friends, which I also so enjoyed. I walked barefooted on the beach and watched the sun rise and set almost every day. And I collected sea shells. “If there were only 25 sea shells left in the world, what would they be worth?” asks author John D. MacDonald. Beyond measure priceless, I assume. Scotch Bonnet is one of the shells for which I always search when I am on this tiny island. 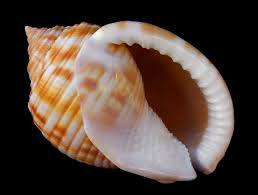 It’s one of the few places in the world this shell can be found. I have one a local merchant gave me some years ago, and it is one of my most prized possessions, but I’ve never found a whole one – almost whole, but not perfect ones. On this trip, I found one that was almost perfect, but it is very old and blackened by age and tumbling through turbulent waters and sand. These lyrics reminded me that my idea of perfection isn’t always the only perspective and that beauty exists simply because it is what it is. The black Scotch Bonnet deserves my honor and respect because of the stories it could tell me, if I pay attention. The old Scotch Bonnet and the Rolling Stones also reminded me that I need to be better at seeing Spirit in everything around me, even those cold, dreary days of winter coming. I need to learn to live in a state of Grace – of appreciating every gift given to me every moment of every day. Most of all, the shell reminded me that I need to see Spirit in the people I love and who love me. Thank you, Scotch Bonnet. I got what I needed. thank you for sharing …. the gift of being present in the moment and receiving is often missed in anticipation of the future. Beautifully said. And a good reminder during this hectic holiday season. Thank you.